The 1909 Philadelphia Athletics season involved the A's finishing second in the American League with a record of 95 wins and 59 losses. The A's also moved into the majors' first concrete-and-steel ballpark, Shibe Park. 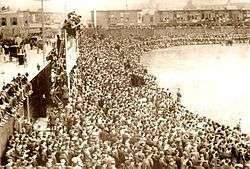 Fans in Shibe Park watching the inaugural game in 1909. In 1909, the A's were wearing an elephant logo on their sweaters.